Rosy's little purple monkey is her favorite "baby". The other day, Mom brought home a big purple monkey for me. I really liked him, but it freaked Rosy out. Now she is afraid that her baby is going to grow as big as mine. I asked her what the big deal would be. She said she doesn't want to have to deal with a teenager and then a baby big enough to leave home. She just wants her purple monkey to stay little forever. I guess all mothers are the same. Yesterday I saw someone wearing a mood ring which got me to thinking. What if I had a mood ball? Well, it would be Yellow a lot anyway cause that means I am feeling OK and using my imagination. It would also be Violet and Blue a lot since I am often very happy and thinking life is good. And when I get to play fetch , I am very excited so it will turn Red. But when tornadoes come and I am stressed so then it would be Gray. When I am sleeping I guess it would be Green for relaxed neutral feelings. 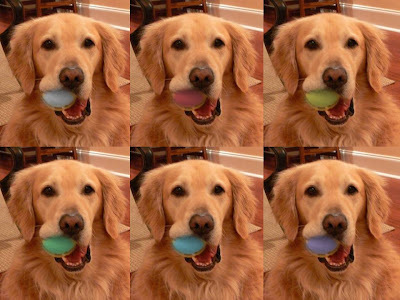 This may be a breakthrough for dogs to communicate with their humans! 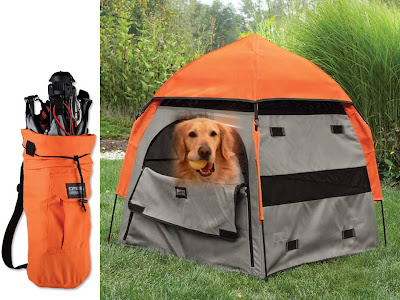 I think I this is a pretty great product idea, dont you? In the midst of our family sadness, Rosy had a teeth cleaning appointment. Rosy came back from the vet with very sparkling whites, but 5 less of them! She had to have 5 teeth pulled! But don't worry about Rosy, she is milking this one good. First she had Mom serving her meals in bed. And since Mom didn't know what Rosy would eat, she prepared Rosy a buffet! Freshly cooked chicken, chicken soup, her fav canned food and even cream cheese balls for her meds! I get dental work next month. I am going to request a buffet as well. Today is my Dad's birthday. It is a big one. In dog years, I can't even count that high. Anyway, since we are still sad, we won't be doing any partying. But that's OK since Dad had a big celebration earlier this month in Mexico. I told Dad he should do whatever he wants today. Of course that is only until Mom tells him to do something else. 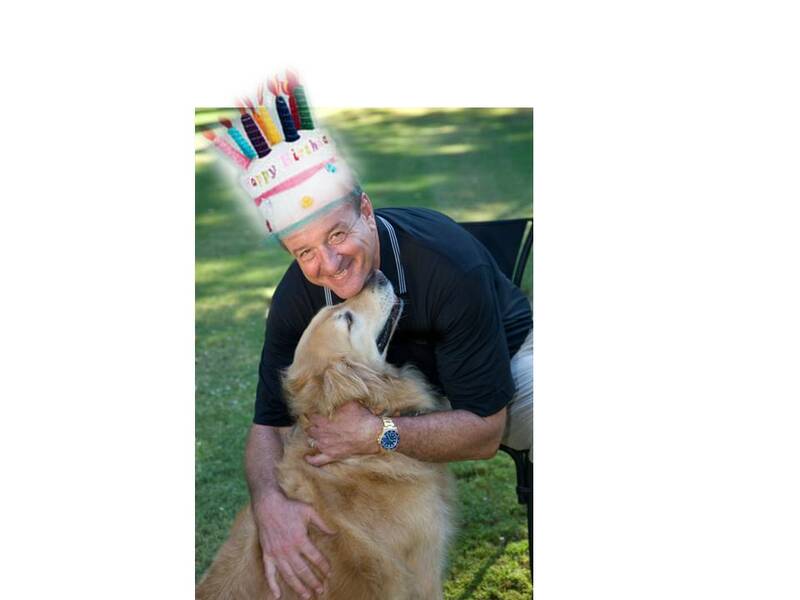 Happy Birthday Dad. I love you very much. Everyone has been asking how I am doing. I am really OK. Of course, I miss Fuzz very much, and I hate seeing my Mom cry and my Dad very sad. I have been trying to cheer them up. 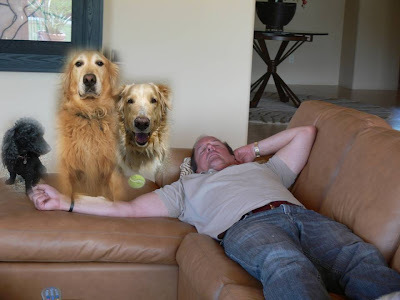 I keep bringing them my ball to play with me, which they do, but it doesn't seem to help. I brought Mom her sneaker to take a walk with me. She did, but I don't think that helped either. 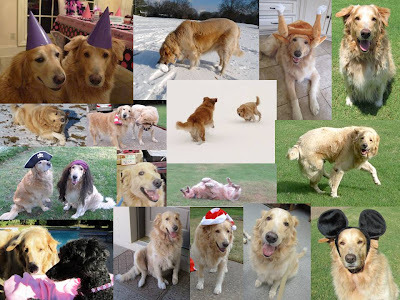 The way I look at it, Fuzz was always a happy dog. And he would want all of us to be happy. Not that I am going to have a party, but I really think he would approve of ordering pizza. I know that would make me happy. 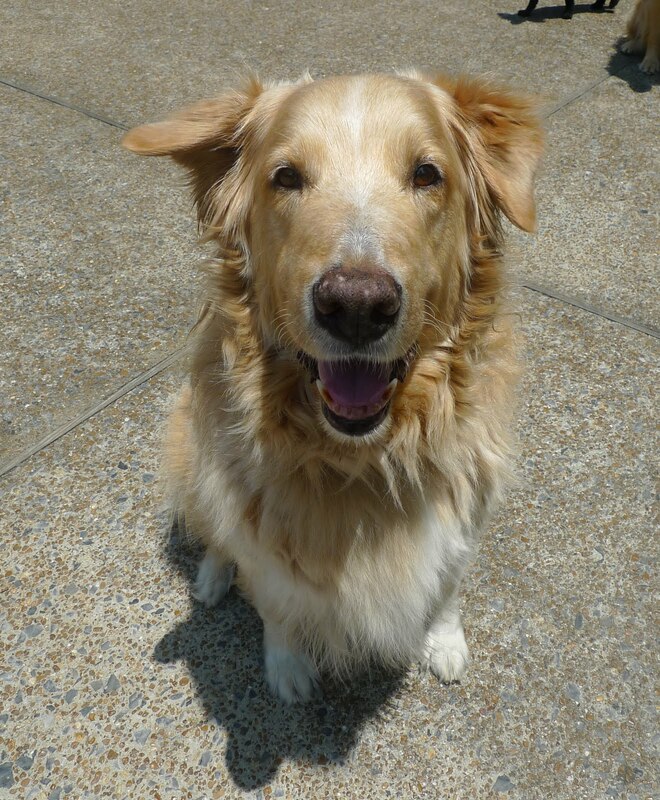 On May 10, 2010, Fuzz arrived at our house. We immediately bonded and became brothers and best of buds. At over 110 lbs, Fuzz was the "Big Boy" of the house. He was a big goof ball that loved to roll, eat and nap. But he was also incredibly sweet and gentle and the best brother in the world. I thought we would live together happily ever after. Well we did live happily, but I don't know why Fuzz left us so early. Now we still have the gift of Fuzz in our hearts. 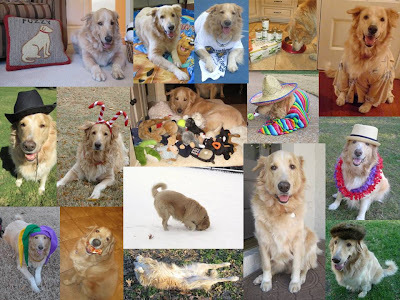 And because Mom takes a bazillion pictures and I have my blog, I get to not only cherish, but share my memories of Fuzz that I hold so close. Fridays will forever be FuzzFridays at our house. So I want to wish everyone a very special FuzzFriday in celebration of my wonderful brother Fuzz. Please have a cookie in his honor. Early this morning, my brother Fuzz went to the Rainbow Bridge. He was very sick but he didn't let anyone know. We thought he just had a tummy ache from all the cookies he ate during his haircut. But he got real sick during the night and Mom and Dad were getting ready to take him to the emergency room. But he passed while lying sprawled out on the grass. I was so hoping he would start rolling. That was his favorite thing to do. We all miss Fuzz very much. Tomorrow I will do a special Fuzz Friday tribute. Yesterday was Fuzz's haircut day. He was a bit nervous when the Aussie Pet Mobile pulled up and Rosy was no where in site. But he jumped into the truck when bribed with a cookie. And he was totally a good boy for an hour because Mom and Dad were giving him a cookie every two minutes. (Yes, I got some too since I stood by looking like I felt left out.) 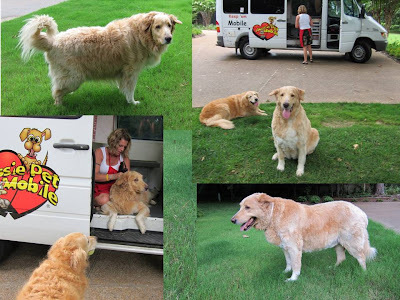 Anyway, when he jumped out of the truck and made his debut he was very proud. I think he actually looks pretty good. And now he looks more like a Fuzz than a Fuzzy. 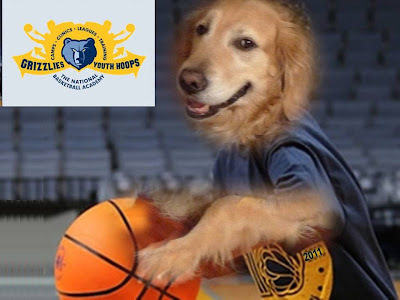 The other day I heard about the Memphis Grizzlies Basketball Camp, called Summer Hoops. You get to learn to play basketball from the ground up. Its for boys and girls ages 7-16 of all skill levels. I am an 8 year old boy, so I should qualify. I asked Mom if I could go. She said being a canine likely will disqualify me. Ugh. I'm sure if AirBud applied they would make an exception. Maybe I will say I am AirBear. 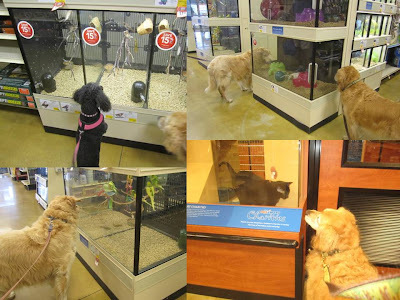 The other day Mom and Dad took us to Pet Smart. It is a new store in the neighborhood, so this was our first time there. What an interesting place. We walked up and down each aisle and Mom got us all sorts of treats. But that wasn't the best part. Rosy loved the little brown birds. Fuzz liked the pretty yellow birds. Fuzz and I also were fascinated by the guinea pig and his plastic cave. My favorite was the pretty black cat. I knew Mom and Dad would say we can't adopt him. Can you? Fuzz, Rosy and I had a long discussion on what to get Dad for Father's Day. Rosy, a typical girl, suggested some fashionable clothing. I said that Dad says he doesn't need any more clothes. Fuzz of course suggested a food gift basket. I reminded him that Dad is trying to watch his weight, so no treats. So we tried to think of something that he really loves, can't buy himself and that we can afford. And we came up with the perfect gift. We gave him quiet time to take a nap! 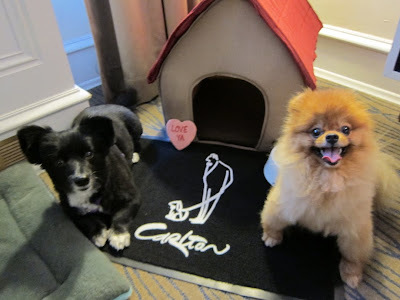 This past week, my niece BunnyBell stayed in the Carlton Hotel in New York City with her friend Simba (and their respective Moms Sydne and Shauna). The hotel partnered with Animal Planet to offer a Pamper Your Pet Package. So of course BunnyBell and Simba, both who are used to being pampered, had to get the package. So when they arrived in their room there was a dog bed, dog blanket, dog bowls with placemat and cookies. They even got an indoor dog house! Their Moms got a list of NYC dog pampering activities like masseuses, groomers, and shopping places. And people think I'm spoiled? I heard my vet tell my Mom and Dad that I should get a haircut. They agreed and set an appointment with the groomer for next week. 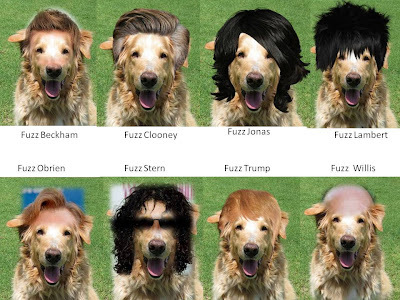 So I figured I would look through magazines and see which hairstyle would look best on me. Some of them would require color, I am not sure Mom would want to pay the extra (although she does for her hair.) 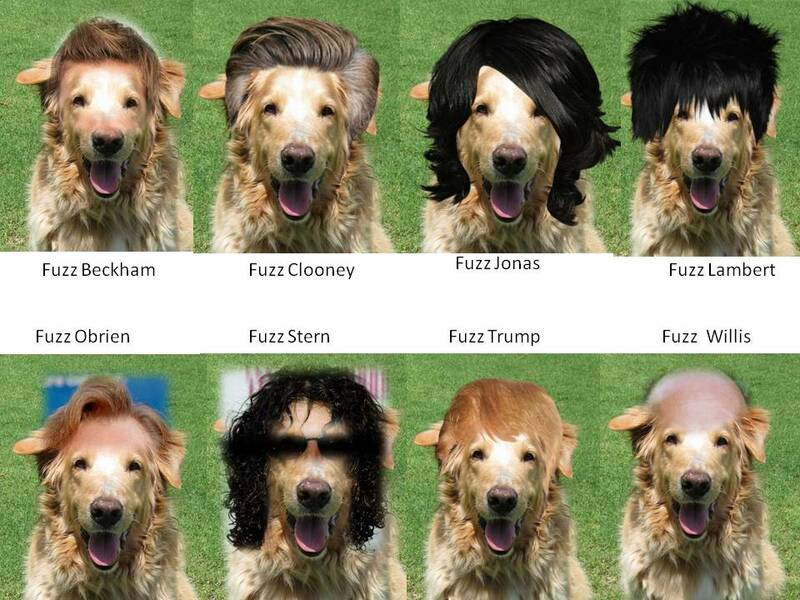 So which style do you think I should ask for? I am back from my vacation. The only thing I didn't get to do was play golf. So in honor of the the U.S. Open this week, Fuzz and I went to the nearby golf course. Fuzz was having trouble with his putting game so he wanted to give up on the last hole. Since I am a good brother, I tried to encourage him to keep trying. Actually, I just wanted him to move so I could make my shot. Yet another cool thing about my hotel. After a long day of swimming in the ocean I got very thirsty. 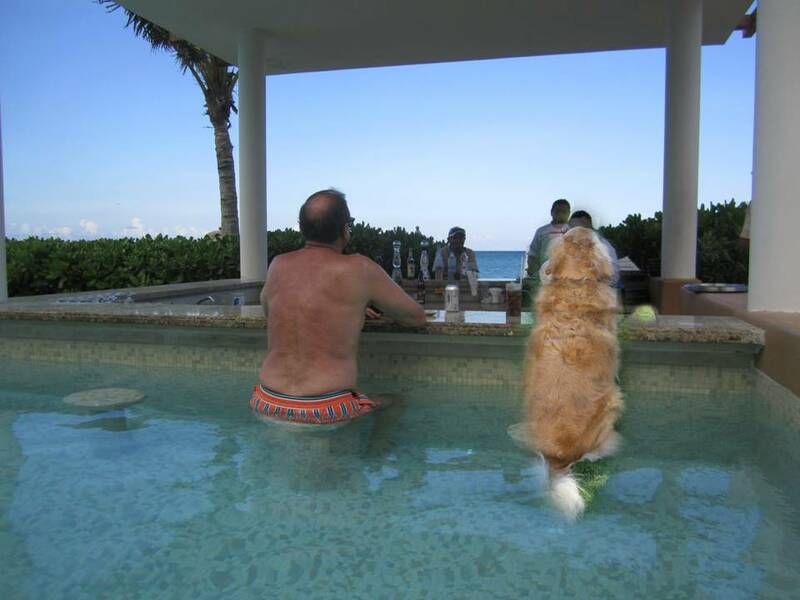 So I went over to the pool and swam up to the bar! I didnt get to have a cerveza since I am not old enough to drink. But I did get a nice cold water (purified of course). I wonder why my pool at home doesnt have a swim up bar? Speaking of which, I guess I need to go home soon. There is a lot of water stuff to do at this resort. Besides the beach and the pools, there is extra water activity in our villa. 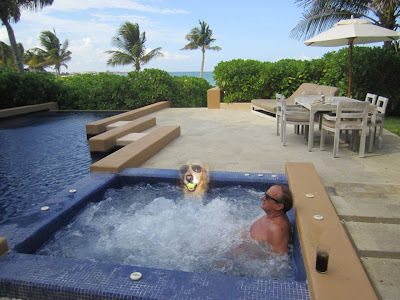 One day I got to go in the spa with Dad. That was cool. Well actually it was hot, too hot, so I got out. 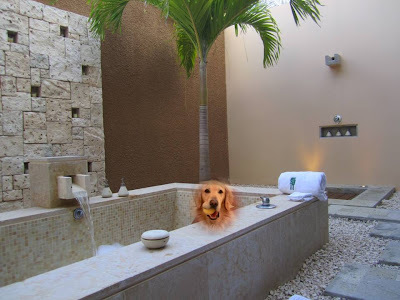 I went inside and then stepped to a private place outside for a soak in a giant soaking tub! Fuzz could have fit too, but he had no interest. He was too busy studying the in-villa dining menu. 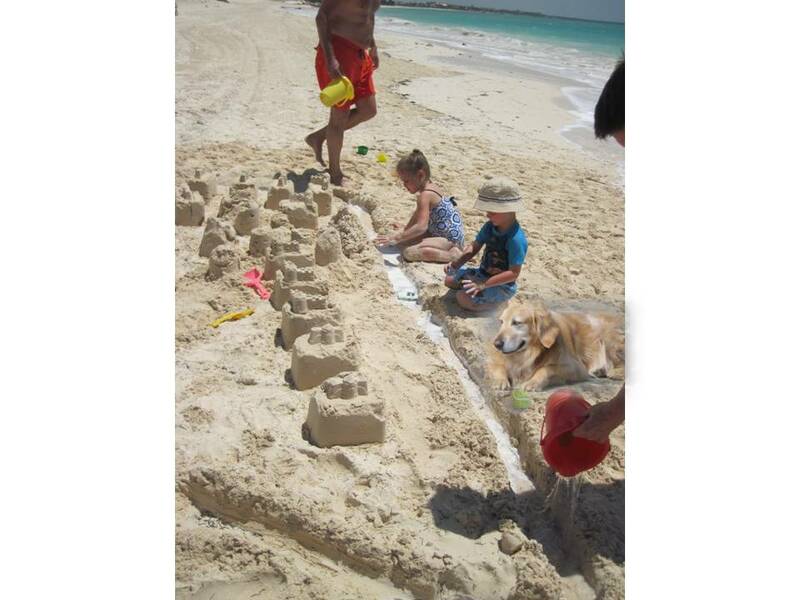 One day at the beach, the whole family decided to build a castle compound. Everyone was working so hard on it. I thought I would help supervise. Then after it was built and the water was in the moat, I decided to take a break and go swimming. 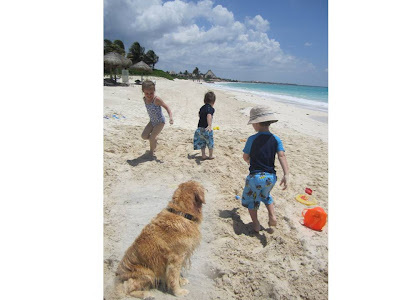 When I came back, the castle compound was gone, and my neice and nephews were stomping on the sand where it once stood. I never did get the point of building sandcastles. Today is my niece Caroline's 5th birthday. So we decided to have a party for her in Mexico. We ordered a beautiful pink cake since that is her favorite color (what is it with pink and girls?) Fuzz got those trick candles cause he thinks it is hysterical when you can't blow them out. 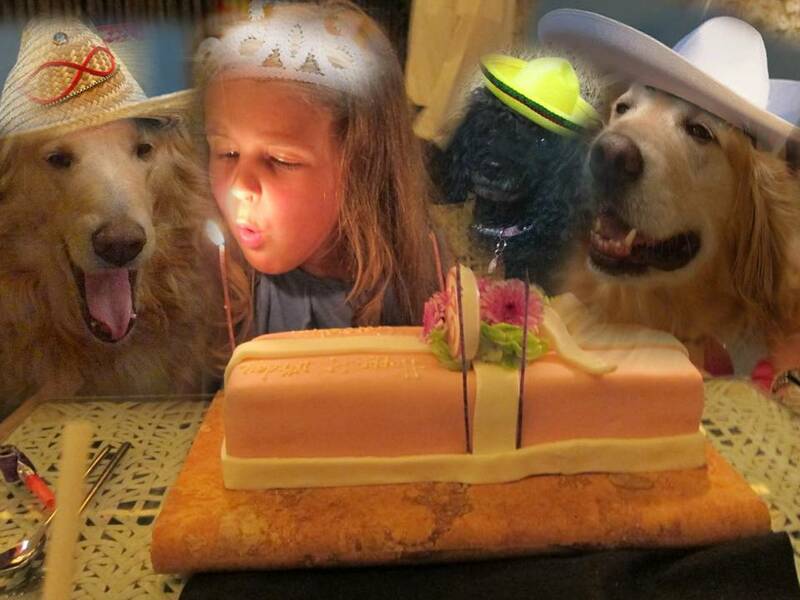 We all put on our Mexican party hats and sang Feliz Cumpleanos Caroline! P.S. While we learned how to sing and say things in Spanish. we did not learn how to type in Spanish. Therefore, there are no tildes or upside down exclamation points. On some days, I didn't feel like spending the whole day at the beach. 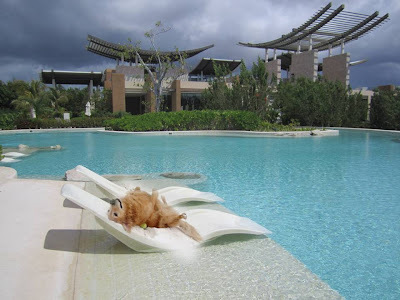 And instead of relaxing in our villa's pool, I thought it would be nice to lounge at the hotel's main pool . I was inspired by the pools name - Reflections. So I spent my time reflecting on what a lucky dog I am. 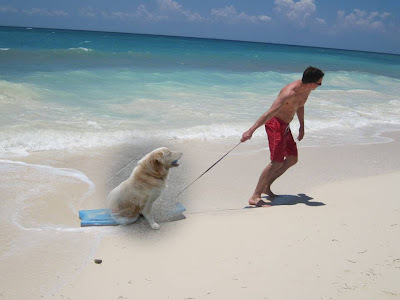 Not every dog has the ability to imagine a Mexican vacation. 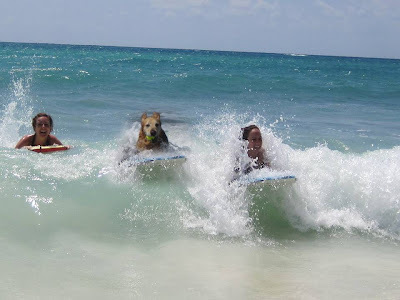 When I got to the beach I saw two of my sisters - Sydne and Bridget - boogie boarding out in the ocean. I had never done that before so I went to join them. That is such a cool activity. Fuzz wanted to stay dry, so he hopped on a boogie board and had my brother-in-law Chris pull him. I didn't think it was fair. I thought Fuzz should be the one pulling. But he said he is not a working dog. Especially not on his Mexican vacation. Since Mom and Dad never came to get us to go to Mexico, I decided to have the vacation in my mind. (I did this back in February for Hawaii and it worked very well.) 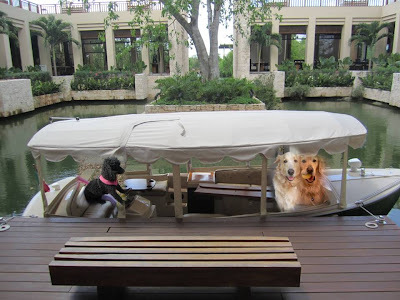 So I took Fuzz and Rosy along and we went to the Banyan Tree Resort in the Riviera Maya, Mexico. 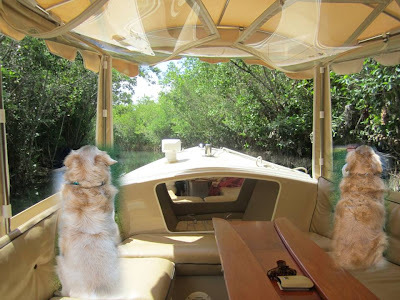 After checking in, we took an electric boat ride to our villa. 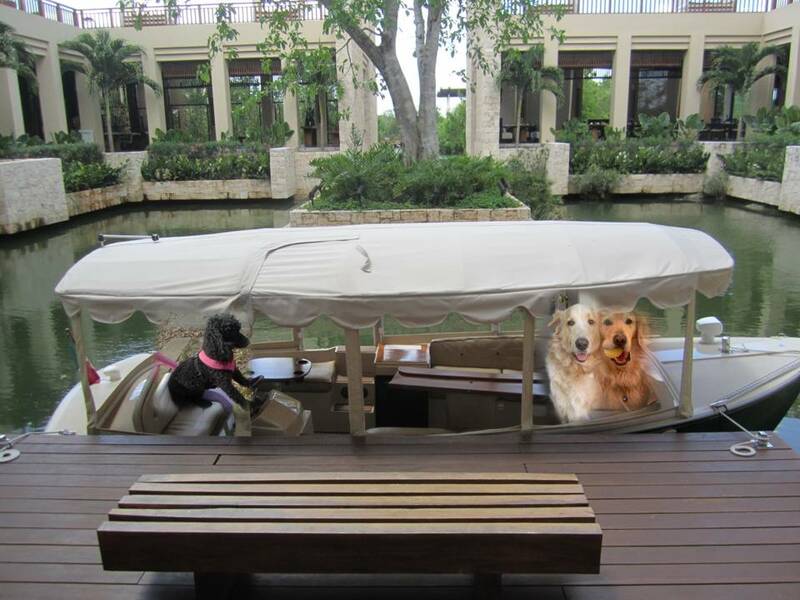 Rosy insisted on driving the boat. So Fuzz and I were content to just enjoy the beautiful scenery. Mom & Dad got picked up in a car to take them to the airport. They told us they were going to Mexico. So Fuzz, Rosy and I went inside and quickly got dressed. When we came back outside they were gone. Well, we are waiting for a car to pick us up and be taken to Mexico too. My computer is packed, so I will not be blogging until I get to Mexico. Adios! June has been proclaimed the Great Outdoors Month in the US. So it got me to thinking, maybe I should try camping. When looking through the Orvis Dog catalog, I saw this incredibly cool pop up tent. I asked Mom if she would buy it for me. She said if I want to sleep in the great outdoors, we have a dog house. But I thought that is where Dad is supposed to go when he gets in trouble?